To be honest, it looks to be a cross of the Ford Endeavor and also the Tata Safari. However, there does seem to be a distinct angle for this SUV. The red and silver Force logo lends the difference in the character here. The grille is all chromed. Poke further and there is a generous gap between the shutline of the bonnet on one side. The wing mirrors look a straight lift from the ones on the Rhino MUV. The fog lamps are big in nature. 16 inch alloy wheels shod with Apollo Hawkz AT tyres lend the vehicle a muscular stance. The daytime running lamps, a first for an homegrown SUV is sure to lend its competitors some sleepless nights. However, the gap between the wheel arches and the wheels is a tad too much. 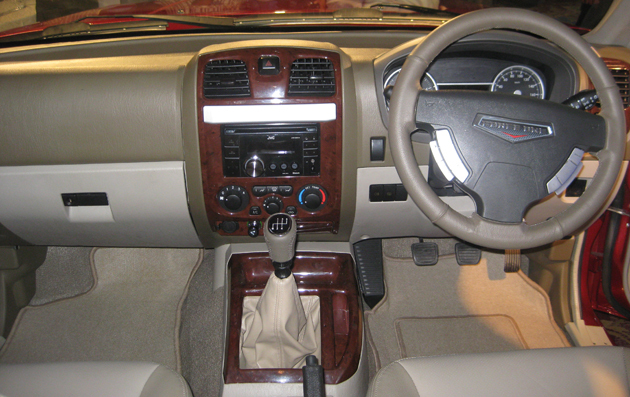 Roof rails as also running boards are provided with this SUV. At the rear, an integrated roof spoiler as also the twin tail pipes try to create some visual drama, however, we aren’t impressed. The rear also uses some design cues from the mighty Landcruiser Prado. If you want road presence, then just like any other SUV, this one has it in plenty. Probably like an Endeavor at half the price. As far as the interiors go, roomy is the one word which would come to mind, be it whichever row. 6 footers are welcome in the third row of seats, which by the way has got the best leg room of all the available SUVs in India. However, those looking to sit in the last row of seats, better not have spikes or else, they would have them slightly messed up. The first and second row of seats, though, have an excellent head room as also leg room proposition. The shocking thing is when the key is turned on, the plethora of warning lights coming up on the dashboard display is stunning. We counted atleast more than a dozen of them and they still came up coming. More like an F1 car. The dials are clearly outlined while there is a multi information display coming up which gives all the relevant information like average fuel consumption and so on. The dashboard has got a mix of both beige and also fake wood. The fake wood does seem very fake and the even the fixtures like the driver arm rest and its under-storage also don’t seem to fit nicely. The car we had got, had the same rocking in its own mounting point. The general plastic quality also felt below par. The steering wheel has got a Chrysler like look to it with the buttons for both the music as also Bluetooth telephony clearly outlined in aluminium. Aa 4 power window switches are nestled next to the driver, however, only the driver gets an auto down function option. The JVC music system works well as well. The glovebox also felt flimsy and more like a Tata unit. It is deep and can carry most of the knick knacks easily. The luggage space at the rear with all the three rows in place is still decent. There are separate AC vents for the third row passengers and there is a separate fan speed controller as well. Neat. To sum it all, it is packed with features. The access to the third row is a bit tricky though. Starting with the steering wheel, it has a certain heaviness to it, which unfortunately doesn’t stay put at higher speeds. 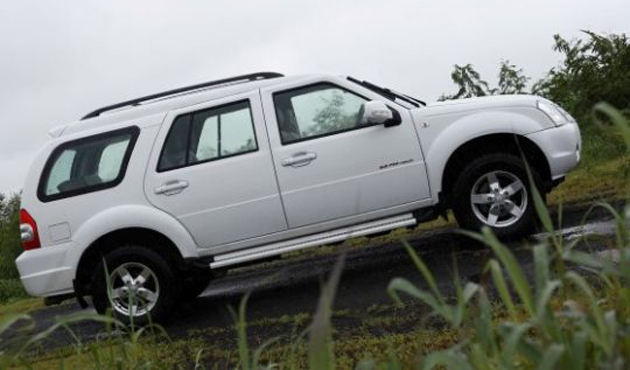 The ladder frame construction means that the SUV is quite rugged unlike some of its monocoque rivals. As of now, there is no 4 wheel drive option but the aforementioned link to the news article would shed some light on the expected dates of the same. There is limited body roll around corners and there is less of the pitching when we went over some real nasty speed breakers. The speed breakers also bring forth the good ground clearance to light. We never had to slow down for the speed breakers. The Force One in India has also got a very good ride quality. It is all absorbing and the expertise from Lotus has definitely helped Force Motors in fine tuning their SUVs ride and handling aspect. If only the steering wheel was a bit more direct in its line. Also, the NVH factor has been well taken care off and unlike the first time attempts by Tata Motors or Mahindra with their Safaris and Scorpios, this one looks like a real good one. There is nothing from inside the cabin that would tell that there is a 2.2 liter diesel engine under the hood. Excellent. On the same vein, the noise insulation under the hood seems to be a very thin thing which wouldn’t stand the test of time. Our test car had the insulation coming off at some points and it looked to be of foam quality. Didn’t we say that Force has relations with Daimler? This relation has resulted in Force Motors acquiring the license of the decade old 2.2 liter common rail diesel engine from Mercedes. 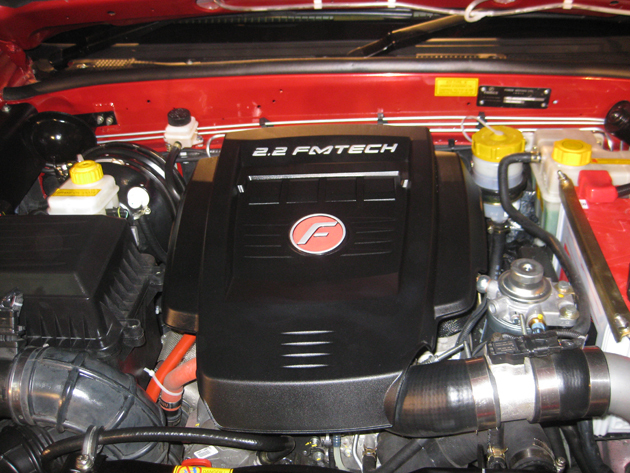 This 2149 cc 4 cylinder common rail engine is named as FMTECH. It produces 140 Bhp of power with 321 Nm of torque. It is mated to a 5 speed manual gearbox, which is also a Daimler unit with heavy localization in it. The question arises as to how did Force Motors manage to get the cost of this SUV under Rs 11 lakhs and that too with a Daimler powertrain? The gearbox for one doesn’t feel as smooth as a Mercedes unit should be. The engine, thankfully enough, hasn’t been tinkered with much and hence is a smooth performer. For the test drive, we couldn’t time this beast, however expect 14-15 second runs for this almost 2.0 tonne SUV. The gearbox has a short throw action but sometimes, it felt rubbery, especially the transition from 4th to 5th. Reverse parking sensors make the job of reversing this car much easier. Also, the brakes, even though, they don’t have ABS in them, certainly are upto the task. Inspite of repeated high speed braking attempts, the SUV’s brakes stood their ground. As far as safety is concerned, the crumple zones as also the collapsible steering column should save one. Yes, you read it right. There is no ABS or air bags on offer as of now. They might introduce it with the 4×4 variant later on. As far as fuel efficiency goes, the MID showed a realistic 9 kmpl figure overall. The Force One is a first time attempt by the manufacturer in manufacturing SUVs. This shows in the way the interiors are put up. However, the general ambience is of cheerfulness and this SUV exudes it. Now, no more fitting of aftermarket LEDs since this SUV already has those in standard. The company currently plans to introduce only one fully loaded variant. Production will be done at the Pithampur plant of Force Motors. The bookings for this SUV has started from September 1st. The Force One price in India is Rs 10.61 lakhs. This is ex-show room price. 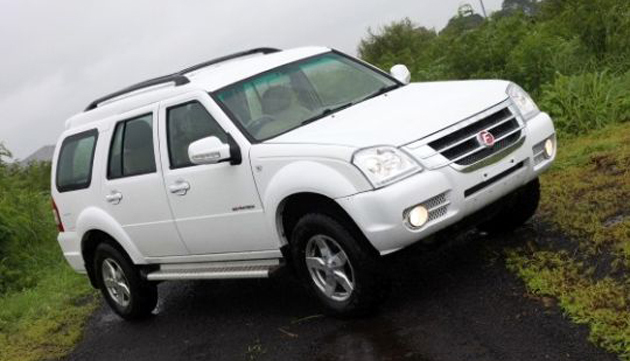 At this price, it tries to compete with the likes of the Tata Safari and also the Mahindra Scorpio. We would reserve our comments for its holding force against these two until a comparison is done between them, the Indiandrives way. Since there is a relative unknown feeling towards the brand, here is a list of Force One dealers. 10.6 L for this model of an unknown brand is definitely too much to ask for. Unless they cutdown on the price, very few ar going to buy it. It looks vanilla and nothing great. Best to go for the new Toyota Avanza @ 7 L price range and a better looking model. Though it has less power in terms of engine volume. the suv car is fabulous but stickers are not avalaible. Mark my words this will be a great SUV.I had my first car a Tata Mobile in 1989 when in college,i have always traveled by road and rarely by train.I am in a job which has allowed me to travel a lot . Whenever a Tempo Trax overtook my car, fully loaded with passengers i would wonder how could it do it till i came to know it had a merc engine below its hood,i was impressed but the looks and the taxi tag was a minus.I have booked a Force One in Black yesterday.The idea of getting the good looking body from Guangdong Foday is not a bad idea at all,why reinvent the wheel,140 BHP Engine from Merc and suspension by Lotus it is bound to succeed. Some teething problems will be there initially and the company needs to be more than ready to sort them out,I am sure for a start this is a job very well done by Force motors. i want to purchase forceone suv imedtly pl send details.how book tiz suv. Do they have any showroom in Gurgaon?